Plumes of black and grey smoke billowed high into the air over the British capital hours after the blaze broke out at the Grenfell Tower where several hundred people live. 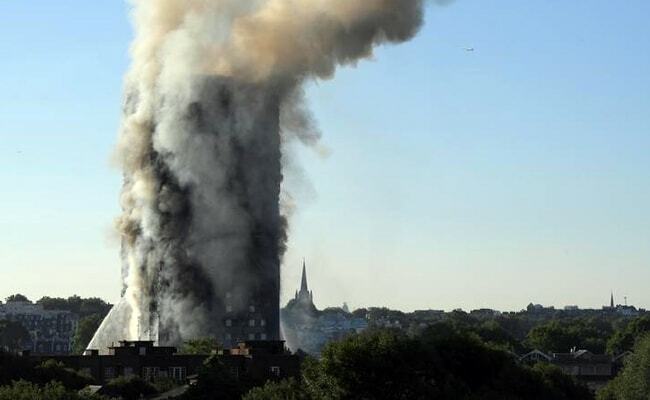 24 storey building on fire in London, claimed half a dozen lives. 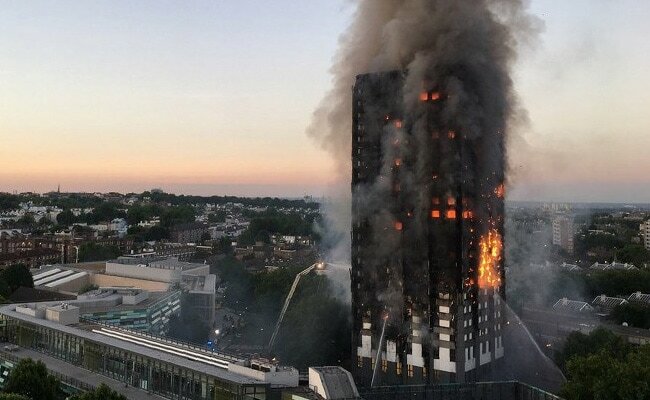 LONDON: Fire engulfed a 24-storey block of flats in central London on Wednesday, killing some people, injuring at least 50 more and trapping some residents asleep inside the towering inferno. Flames licked up the sides of the block in the north Kensington area as 200 firefighters, backed up by 40 fire engines, fought the blaze for hours. Residents rushed to escape through smoke-filled corridors in the housing block after being woken up by the smell of burning. Some said no fire alarm sounded. Witnesses said they saw trapped residents desperately shouting for help from windows on upper floors as flames enveloped the building. 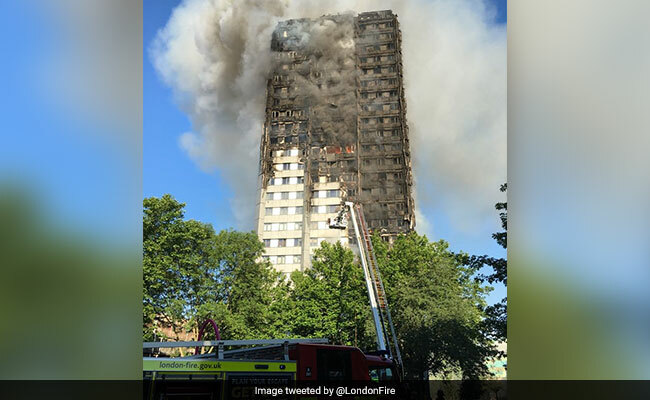 London Fire Brigade said the fire engulfed all floors from the second to the top of the block which contained 130 apartments. 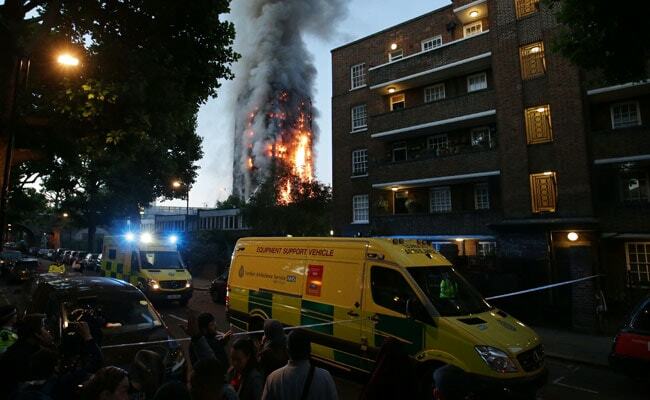 London Fire Brigade said the fire engulfed all floors from the second to the top of the block. "I am very sad to confirm that there have been a number of fatalities, I cannot confirm the number at this time due to the size and complexity of this building." London Ambulance Service said more than 50 people had been taken to hospital. A witness told Reuters she feared not all the residents had escaped the fire. Some were evacuated in their pyjamas. "I looked through the spy hole and I could see smoke everywhere and the neighbours are all there. There's a fireman shouting 'get down the stairs'," one of the block's residents, Michael Paramasivan, told BBC radio. "It was an inferno." "As we went past the fourth floor it was completely thick black smoke. As we've gone outside I'm looking up at the block and it was just going up. It was like pyrotechnics. It was just unbelievable how quick it was burning." 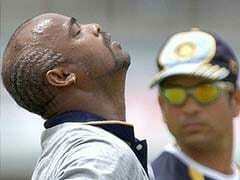 The cause of the fire, which broke out just before 1 a.m. (0000 GMT), was not known, the Fire Brigade said. Residents said repairs had been made recently to the exterior of the block. Ash Sha, 30, who witnessed the fire and has an aunt in the building who managed to escape from the second floor, said the local council had renovated the tower. "One year ago the council renovated the building both externally and internally," Sha said. London Ambulance Service said more than 50 people had been taken to hospital. "They cladded the outside and insulated the inside. The insulated material is very similar to sponge so it crumbles in your hand. This was just done to tart it up and match the nearby building." The local council of Kensington and Chelsea, which owns the block, said its focus was on supporting the rescue and relief operation. It said the causes of the fire would be fully investigated. More than 20 ambulance crews were at the scene. London Mayor Sadiq Khan said a "major incident" had been declared. Police closed the A40, a major road leading out of west London, while some parts of London's underground train network were closed as a precaution. "There was bits of building falling off all around me, I scalded my shin on a hot piece of metal that had fallen off the building," said Jodie Martin, who lives close to the building and sought to save people from the fire.